Say the words 'Fried Green Tomatoes' and I know that many people of my age and demographic will think of only the movie from the 90's bringing up thoughts of warm southern summer nights (even if you aren't from the South) and late night laughter in the kitchen. Also, a dish that can be tricky to get just right. Well, I had never attempted before (thus the website name including the word experimental), but I found this to be a mighty tasty addition to a late summer meal. that in essence, most varieties of green tomatoes are simply unripened versions of your average tomato. The main benefit of this is that they are still quite firm, a quality they retain after frying. Despite being unripened, they are surprisingly sweet after frying, mixing with the saltiness in the coating, you will have an all around pallet pleaser. 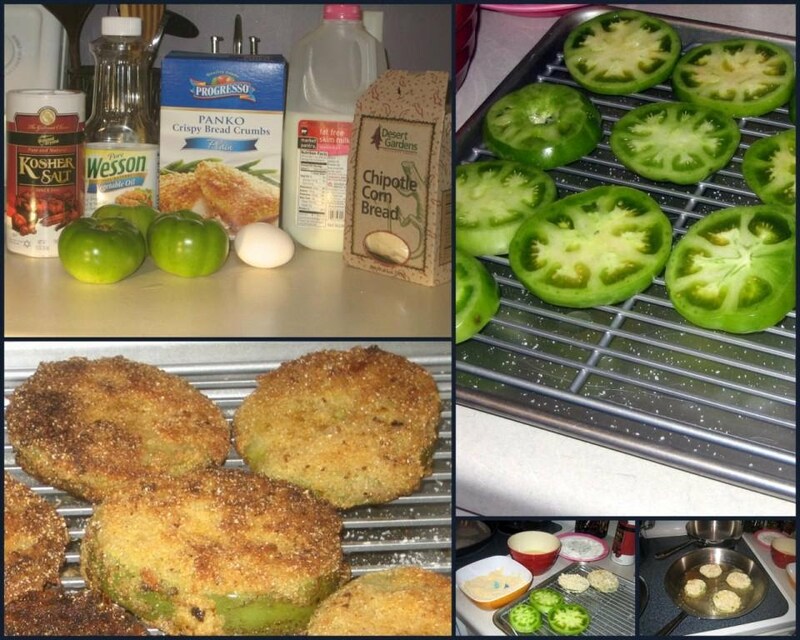 Moral of the story, if you like the movie or like trying something new, Fried Green Tomatoes are a definite yes for you! Wash tomatoes and pat dry. Core the top of the tomato and slice them into 1/2 inch width slices. Set on wire rack and salt and pepper lightly. Let sit while completing the rest of the prep work. Start heating your oil over medium to medium/high heat in a large fry pan or saute pan (preference is 12" or larger to leave enough room for the tomatoes to not be touching). Lay out three low bowls. In the first bowl, mix flour, a pinch of salt and a pinch of cumin. In the second bowl, whisk together the egg and milk. In the last bowl, pour the bread crumbs and cornmeal. This one can be mixed with a fresh herb, like chopped parsley, to add freshness. When the oil is ready (usually can tell when putting a drop of water in the oil makes it sizzle), dip the tomato slices in the flour bowl, then the egg/milk mixture and last in the bread crumbs/cornmeal mixture. Carefully place the coated tomato in the hot oil and cook for a few minutes on each side until golden brown. Place on plate lined with paper towels to soak up some of the oil and let them cool slightly. Serve while still warm. Would go really well with a side of aioli dipping sauce.